A couple Sundays ago I did something while playing golf that I’ve done maybe twice before, ever. I walked off the course without finishing the round, because I was just too hot and tired to go on. You might have felt the same way since then, as the local heat wave continues to batter the Cape Region. One way to beat the heat and still enjoy golf is to sit in a cool spot and read about your favorite sport, instead of risking sunstroke on the twelfth hole. 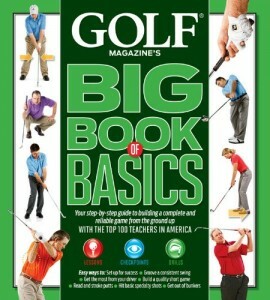 For less experienced golfers, take a peek at Golf Magazine’s “Big Book of Basics” ($32.95 SRP). Edited by David DeNunzio, this book features instruction from the Magazine’s Top 100 Teachers in America. They suggest it is aimed at those who are new to the game, or experienced golfers trying to re-establish their basic skill sets. The book begins where most such instruction manuals start, with a detailed segment on the grip, stance, posture, and aiming. After all, if there’s anything wrong with these fundamentals, it will be next to impossible to figure out any mechanical swing problems. From there the teachers go through the basic swing with irons, and on to the driver and fairway woods. 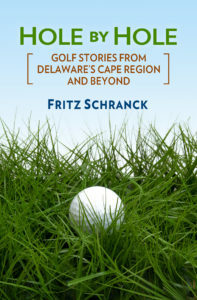 Heavily illustrated, each chapter provides point by point graphics and short, punchy prose to make each part of the golf game well understood and capable of repetition, on the range, putting green, or out on the course. I especially like the fix guides, in which common swing errors are shown, along with a guide to repairing them as found elsewhere in the book. 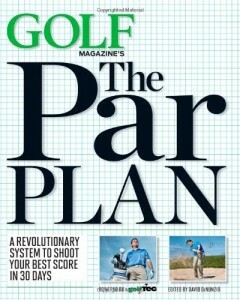 For golfers who are farther along in their game, check out Golf Magazine’s “The Par Plan”, a combined effort between the magazine and GolfTec, a golf-improvement company well-known for its video analysis apps ($29.95 SRP). Again edited by DeNunzio, the book is certainly useful by itself, but the real hook is its coordination with the My Pro to Go App, which can be downloaded onto smartphones. Each chapter describes certain situations, outlines specific drills to deal with the situations, and charts a practice plan to learn and fully integrate the combined lesson. The software tie-in assumes that a buddy will shoot video of your swing for each area of interest, such as the short-game stroke. The book will then explain what to be looking for while watching the video, and provide tips to help bring your own video clips closer to the intended results. All this is supposed to be accomplished in 30 days. That’s a pretty ambitious schedule for anyone still working for a living, but the suggested timeframe is the least important element of this interesting instruction manual. I thought one of its best segments related to discovering “your stock shot”, using the My Pro To Go App to help identify how you really play, as opposed to how you think you swing. It is a step removed from visiting a teaching pro and spending time with a launch monitor, but it should be a useful tool for those seeking to establish a consistent approach to their game. The segments on game management out on the course should also be a big help. The Kings Creek Country Club 18 Hole Ladies Golf League played a game format called Team Cha Cha July 19. Anita Pettitt, and Melanie Pereira joined with blind draws Sherry Pie and Jo Ann Pearlman for first place. Second spot went to the team of Judy Wetzel, Atom Irwin, Amy Micholas, and Barb Hines. Barb Hines had the closest to the pin for the day, with a shot ending 3 feet 6 inch from the eighth hole.